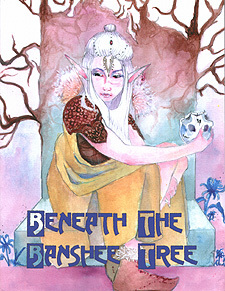 Beneath the Banshee Tree is an investigative city adventure for the Sertorius roleplaying game. Powerful spellcasters called Sertori come from every corner of Gamandria to the mountain city of Talyr, answering the king’s call for new talent to fill important offices. However his invitation attracts someone with sinister motives who exploits the abundance of magic to enact an unthinkable scheme. After a series of mysterious events the players are recruited to solve the puzzle and weed out the evil presence in Talyr. But it is a race against time as they hunt for clues and try to piece them together before something terrible unfolds. This 69 page investigative module comes with an adventure, several detailed NPCs, a city map, a full description of the city of Talyr, and a unique investigative structure that makes for a different experience each time you play. For use with the Sertorius rulebook by Bedrock Games.